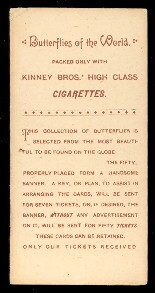 Issued by Kinney Bros. around 1888 this set contains 60 cards featuring Butterflies of the World. The first 10 cards in the set are white background and are numbered. 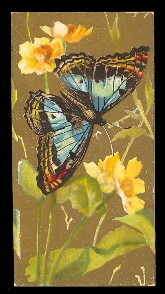 The remaining 50 cards are gold background and unnumbered. When placed together these cards form a large picture. 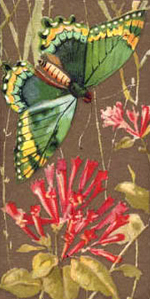 The cards measure 1-3/8" X 2-3/4".